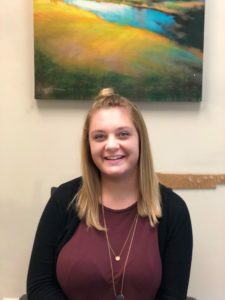 AmeriCorps Spotlight: Ashley Cornell - CARITAS - Shelter. Jobs. Recovery. Hope. What that means: Every week I compile a list of housing and job opportunities that is presented to the clients to help transition them out of homelessness. I also sit in on meetings with the case managers to learn how best to address client needs. Background: I was born and raised in Fredericksburg, VA and received my B.A. in Psychology with a minor in Criminal Justice from James Madison University. My sister, Allie Cornell, is the single men’s case manager here and she is the one who got me involved with CARITAS. Hobbies & Interests: I enjoy hiking, reading, playing with my dog, and traveling. I Most Want To Visit: Ireland has always been on my travel bucket list! Favorite Place I’ve Lived: Harrisonburg, VA because I was living so close to Skyline Drive which has tons of great hiking spots. Massanutten was also very close so in the winter my friends and I would frequently go skiing and tubing. I Can’t Live Without: My family and my friends. I have a very large, loving family and they support me in every way so I definitely wouldn’t be where I am today without them. Best Part Of My Service Position: The best part of my job is seeing clients go all the way through the process and ultimately end up with stable housing. I have only been in my position for a little over a month but I already have learned so much and look forward to learning even more!